This is a picture of Gerry Fialka. Gerry's next message contained a request of a more immediate nature. He wrote "send a bio asap". This induced panic because I haven't needed an artist bio for any reason in about 2 decades. My old bios do not seem appropriate for today's modern life style. Online there is my sketchy Blogger profile, which I figure is as much as anyone needs to know about me before reading Mixed Meters. I set to work writing a new bio and kept editing it until even Leslie was happy with it and I sent it off to Gerry. Haven't heard from him since. All this got me thinking that I could post several of my own old bios which I would resurrect from old program booklets. I could post them chronologically. It would be like a mini autobiography. Unusual things might be revealed. Repetitions might be noticed. People might learn some things about me. Sentence structures might be repeated. As you might expect, since the same information is being covered each time lots of things get repeated. The trick is to enjoy the subtle differences. It may not be a great idea for a blog post, but it's good enough. "Ever since I was born (in the dark of night, in the late August, 1951), I have been a Virgo. "At an early age I wanted to be a cartographer and I learned to amuse my friends by explaining the meaning of the word. "I avoided work for nearly two decades by attending school, although I spent my summers by filling candy machines, sandblasting jet aircraft maintenance equipment, painting things yellow and selling appliances. "Now this model here has nearly four more cubic feet of freezer space and is available in harvest gold. "I like to drink brandy and I wish I had enough time to play chess or go to the zoo. "I enjoy the sound of the glass harmonica. "Some of my favorite music is by Dufay, Scarlatti, Mozart, Sousa, and Webern, and the color blue. "I dislike automobiles (especially in large quantities), politics, and the television, and I really ought to learn to vary my sentence structures a bit more. "I'm a devout pessimist and having discovered the gloomiest aspect of any situation, will proceed to make it known to all who will listen. "As Laurence Gold pointed out to me in one of his moments of greatest understanding: 'It's not fair to impute that the continuity has suffered for the lapses of time, since there wasn't any continuity to speak of in the first place.'" A pdf of the whole program book is here. DAVID OCKER, clarinetist, specializes in the performance of contemporary music for both clarinet and bass clarinet. The solo part to Frank Zappa's MO 'N HERB'S VACATION was written for him, and he has played on two of Frank's albums as well. A recent recital of solo clarinet works was well received with the Los Angeles Times reporting: "Both brash and beguiling, he played with marvelous fluency and expressive nuance." He holds degrees from Carleton College, Northfield, Minnesota, where he also taught, and from the California Institute of the Arts, Valencia, California. His principal clarinet instructors included Richard Stoltzman, Michelle Zukovsky, Phillip Rehfeldt and Cloyde Williams. Since 1977, OCKER has worked for Frank Zappa as orchestrator, music librarian and copyist of both scores and parts. As such he has been closely involved in the preparation of music for this concert. Also a composer of music for chamber ensembles and of sound environments for magnetic tape, OCKER was a founding member of the Independent Composers Association. This presenting organization for chamber and electronic music, improvisation and performance art has provided many concerts of new music in Southern California over seven seasons. 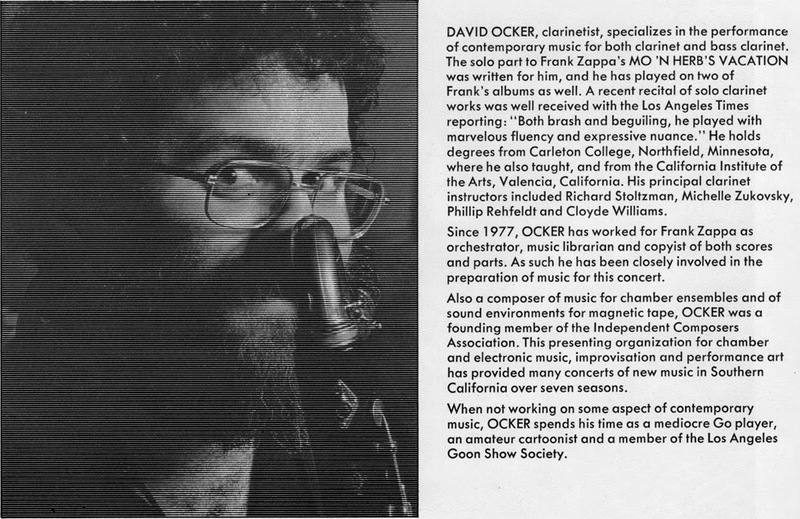 When not working on some aspect of contemporary music, OCKER spends his time as a mediocre Go player, an amateur cartoonist and a member of the Los Angeles Goon Show Society. David Ocker is a musician with dark, curly hair, a beard and a raucous laugh who occasionally wonders why he lives in Los Angeles. One of the things he likes to do best is play clarinet and bass clarinet, especially contemporary solo and chamber music. In 1983 he recorded the solo part to Frank Zappa's clarinet concerto "Mo'n Herb's Vacation" with the London Symphony Orchestra conducted by Kent Nagano, a part which had been written especially for him. Recently Ocker has begun to expand beyond the interpretation of notated music in an improvisation trio with wind players Vinny Golia and Ann LaBerge. Another thing David Ocker likes to do is compose music. In 1976, in an attempt to provide an outlet for his composer's habit, he helped found (and was later President of) the Independent Composers Association, a co-operative presenting organization for chamber and electronic music, improvisation and performance art. Another category of Ocker's musical efforts is that of music copyist, spending many hours at a desk writing out all manner of music. He also feels that he spends altogether too much time in the preparation of resumes and biographies, and continues to wonder why he writes these things in the third person. David Ocker's music, as described by the Los Angeles Times "can intrigue, fascinate and entertain even the jaded listener. Eclectic in the most positive sense, Ocker reveals his influences - Brahms, Ives, Copland and jazz - sometimes eloquently, always without self-conciousness." The largest portion of David Ocker's music is for acoustic instruments, although he has also created works on tape and in software. His wealth of experience as a clarinetist and his love for the music of the past inform his composition, sometimes in very direct ways. He has derived a bass clarinet solo from a movement of a Brahms symphony, and replaced the notes of a Bach prelude and fugue to create a new work for piano. He has two works for chamber orchestra - Waiting for the Messiah and Melodic Symphony, as well as a chamber piece with soprano and narration aimed at younger audiences - Young Finny from Fwyynyland. Ocker's music is characterized by infectious, propulsive rhythms which give his works a sense of being driven to their inevitable conclusions. Whether it is the long slow arch of Waiting for the Messiah or the slippery metrical maze of Pride and Foolishness, his music is somehow simultaneously familiar and surprising. Ocker's music has been performed on the Los Angeles Festival, the Pacific Contemporary Music Festival in Seoul, South Korea, and the Monday Evening Concerts. When the California EAR Unit played Pride and Foolishness at the Cal Arts Contemporary Music Festival in 1988, John Henken described it as having "the dark grace of some jazz arrangements of Bach, compounded in equal measure of minor mode moodiness and insistent rhythmic swing." A graduate of Carleton College and the California Institute of the Arts, David Ocker was a founding member and later president of the Independent Composers Association. He was also a founding member of XTET, a chamber ensemble with a special interest in the music of the twentienth century. He is probably best known through his long association with Frank Zappa, for whom he worked as clarinetist, orchestrator, copyist and Synclavier programmer. My online Leisure Planet bio still lives here. DAVID OCKER '73 David has been active in the Los Angeles contemporary music scene since arriving there in the mid '70s. 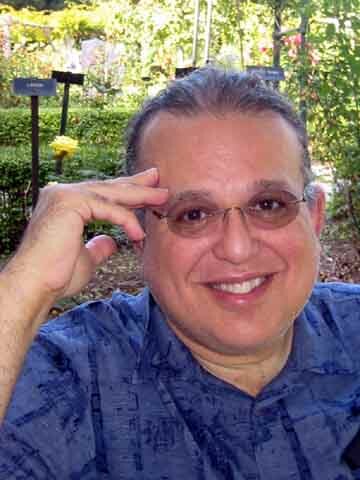 He is a founded (sic) member of XTET, a contemporary chamber ensemble, that performs often in the Los Angeles area. His compositions, such as Waiting for the Messiah, the Melodic Symphony, and Young Finny from Fwyynyland, have been performed at the Monday Evening Concerts, the Los Angeles Festival, and the CalArts New Music Festival. He has appeared as clarinet soloist with the London Symphony Orchestra in London performing the world premier of Frank Zappa's Mo'n Herb's Vacation. These are all avocational pursuits. His true profession is music calligrapher. He has worked closely with Frank Zappa and William Kraft and has just finished preparing the piano-vocal score for John Adams' recent opera, The Death of Klinghoffer. But even more importantly, he just recently got married. Soon after David Ocker’s education at Carleton College and the California Institute of the Arts he was hired as “musical secretary” to iconic composer Frank Zappa. Ocker earned album credits from Zappa as clarinetist, synthesist and orchestrator and experienced his "15-minutes of fame" during a 28-minute solo performance of a Zappa work with the London Symphony Orchestra. According to Zappa Ocker did "Synclavier Document Encryption" on the Francesco Zappa album. He even asked Ocker to write the liner notes for that release. Ocker also had a behind-the-scenes role in the "While You Were Art" incident. Since leaving Zappa’s employ Ocker has earned a living in the exciting world of freelance music preparation, working regularly for noted classical composers such as John Adams, Esa-Pekka Salonen, William Kraft and Anders Hillborg. 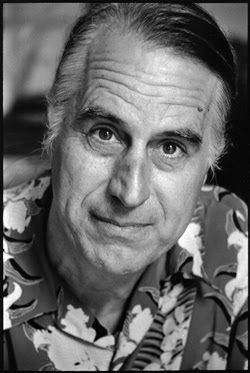 Ocker was co-founder of a composers collective (the Independent Composers Association), a chamber group (Xtet) and an improvisation trio (with Vinny Golia and Anne La Berge). Lacking commissions, awards, recordings or performances for his own music, David Ocker thinks of himself as a "failed composer". 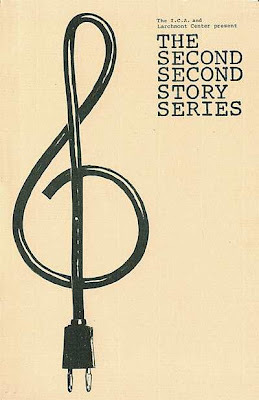 He learned a valuable lesson, however, when he tried to quit writing music altogether: he couldn't stop. Now he spends happy purposeless moments exercising his aural imagination via computer sound software, the results of which he posts to his blog Mixed Meters. In the visual realm he publishes curiously-devoid-of-context photographs on a Tumblr entitled Mixed Messages and videos on a website called YouTube. And he still wonders why he writes his biographies in the third person.